When you’re bored of the traditional, try playing chess with your favorite TV characters, superheroes, or historical figures! Since chess is a game of battles and war, historical events offer plenty of inspiration for themed chess sets. Almost all of the great, most memorable battles throughout history have had one or several theme chess sets dedicated to it. The Battle of Gettysburg, Pearl Harbor, Roman, Vikings and even the Crusades are just some of the bloody historical events that can now be played out on the chessboard. An interest in historical battles seems to often go hand in hand with an interest in chess, so these historically themed chess sets are always in high demand and make very good gifts! Fantasy themed chess sets take all the drama of a historical battle and infuse it with more magical or mythical elements. With this type of chess set, you can pretend to be a Knight of the Round Table fighting off the forces of evil, or a brave warrior facing down an army of dragons! The sky’s the limit when it comes to fantasy chess sets, and if you can imagine it, it probably exists somewhere! Popular culture also offers a lot of inspiration to the makers of themed chess sets. You’ll find that many are modelled after super heroes, video games, or popular TV shows and movies such as Game of Thrones and Harry Potter. Character chess sets are just another way that creators of these popular characters can merchandize their creations, so they’re likely to only get more and more popular as time goes by. This 3D Dragon Chess Set certainly falls into our “fantasy” category of themed chess sets. And, truth be told, it’s one of the best products available in that category. 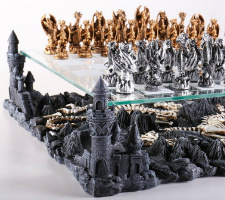 The finely detailed pieces and dramatic board make The 3D Dragon Chess Set an eye catching set and certainly one of the coolest theme chess sets on our list. This would make a great give for any imaginative chess lover with a flair for the dramatic. The pieces in this chess set are all modelled after different types of dragons in various poses. They are made of solid metal which gives them a pleasant weight and feature thin felted bottoms which help protect the smooth finish of the glass playing surface. 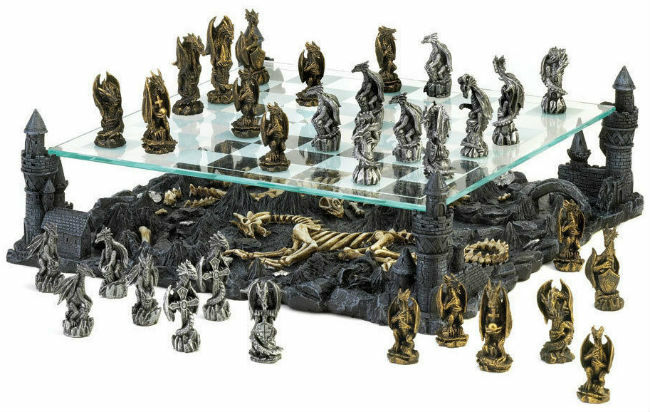 And, speaking of the playing surface, the chess board features a glass play area suspended above a remarkably detailed sculpture of crumbling castles and charred dragon battlefield. The squares are alternating clear and frosted glass, so you can still get a good look at the desolation below. At nearly 16 inches square and over 5 inches tall, this chess board is truly the star of the show. It’s guaranteed to catch the attention of anyone who shares a room with it, and you’re bound to get a ton of questions and compliments on this one of a kind statement piece! 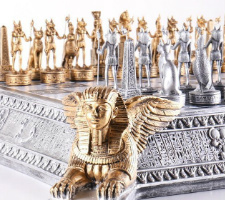 This gold and silver chess set perfectly captures the opulence of ancient Egypt. Just looking at it will transport to you to a whole other time in history. The shine from the pieces and board will catch anyone’s eye and draw them in, where they will quickly notice the incredible detail that went into crafting this historical themed chess set. The Gold & Silver Egyptian Chess Set is one of the most impeccably detailed sets on our entire list. 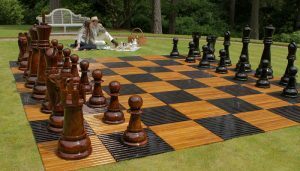 The chess board is very large at 22 inches square, and features decorative sphinx sculptures adorning each of the board’s four corners. Along the sides, the board is decorated with etchings of ancient Egyptian hieroglyphics and other evocative imagery. The squares of the board are each 1 ⅝ inches and they feature inlaid hieroglyphic details as well. 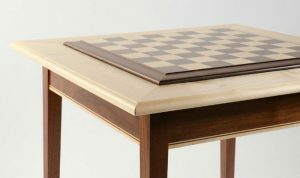 This remarkable board is not only beautiful but also functional – the squares are perfectly sized for the metal themed chess pieces during play, and there is even room inside for storage when they’re not in use. 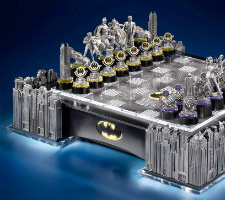 If you’re a fan of the caped crusader, we have the perfect themed chess set for you. While some might see this set and immediately think that it’s intended for children, if you’re a true comicbook or superhero movie fan, you’ll know that couldn’t be further from the truth! The Batman Gotham Cityscape Chess Set is made from high quality materials that are designed to stand the test of time- it’s definitely no children’s toy. The pieces are made of heavy weight pewter and die cast metal, and they’re modelled after different characters from the Batman universe. All of Gotham’s greats (and its worst) are included in this set, like Robin, the Batmobile, Batgirl, Commissioner Gordon, Catwoman, Penguin, Joker, Riddler, and of course Batman himself. The chess board made for this set is the perfect stage for Gotham’s most epic battles. 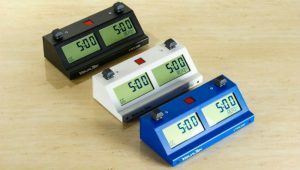 It is huge, clocking in at 20 inches square, and it even features a Bat symbol button that, when pressed, causes more than 50 LEDS around the board to light up. Talk about dramatic effect! The set also includes a storage box for the pieces, if you ever want to put this set away! 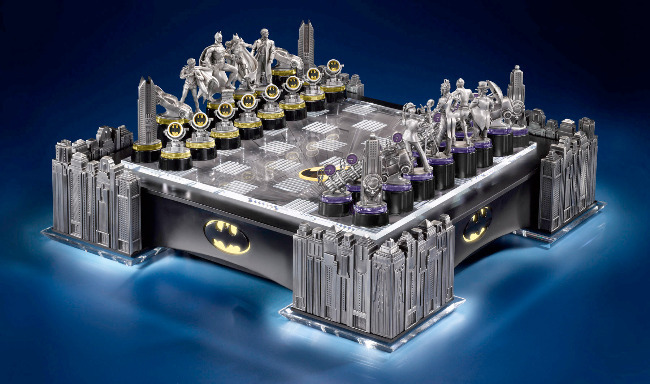 You’ll have tons of fun facing off against Batman’s fiercest foes on this over the top themed chess set. The best part is that the pieces are so well made that you’ll be able to enjoy this chess sets for years and years before passing it on to the next generation of little superheroes. Another pop culture themed chess set, this one is a replica of the giant, magical chess set featured in the Harry Potter series. Any fan of the books or movies will vividly remember the scene in which Harry, Ron and Hermione had to play a dangerous game of wizard’s chess in order to stop Voldemort from stealing the stone that would grant him everlasting life. It’s a tense moment when Ron volunteers to sacrifice himself so that his friends may proceed through the dungeon. With The Final Challenge Theme Chess Set, you can relive that scene anytime you like! This set makes a great gift for children and adults alike, and it’s a great collector’s item for both Harry Potter fans and chess players. It’s one of our favorite sets and certainly the best movie-themed chess set out there. 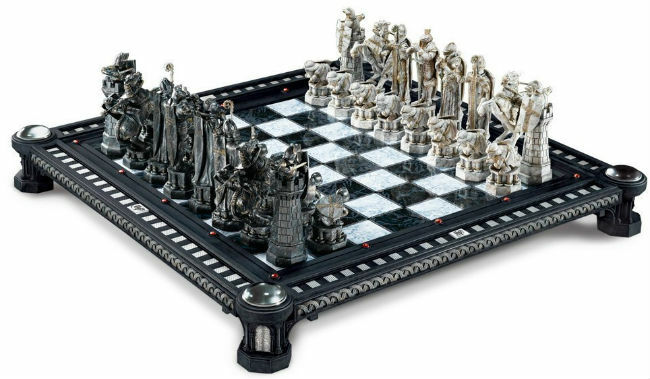 Every piece of this chess set is high quality, from the die cast zinc pieces made to match the pieces featured in the movie in exact detail to the plexiglass chess board that mimics the natural stone of the playing surface featured in the movie. You will definitely not be disappointed with this set! This historical themed chess set is a model of one of the most memorable battles in American history. The Battle of Gettysburg, one of America’s bloodiest battles and a definite turning point in the Civil War, has long captured the imaginations of history buffs and the general public alike. 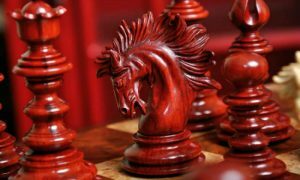 Many movies have been made about it, countless books have been written, and dozens of themed chess sets have been created. 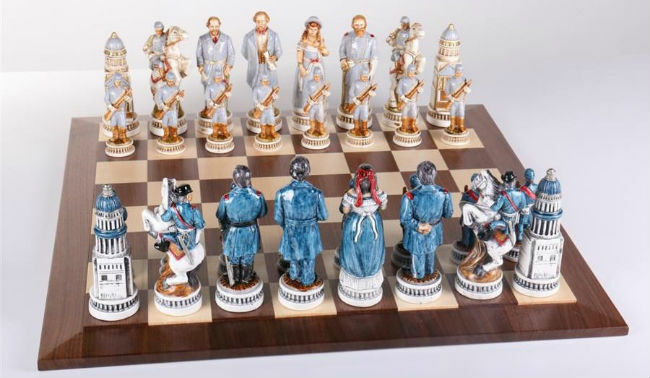 This Battle of Gettysburg Chess Set is the best of the best. The themed chess pieces included in this revolutionary war chess set are a work of art in their own right. Each one is formed from oxo-teak and then hand painted with astonishing detail by Italian artists. They feel like stone to the touch as they tower over the board, with King pieces modelled after Robert E. Lee and Ulysses S. Grant standing 6 inches high! The chessboard is handcrafted in Pennsylvania, actually only a few miles from where the revolutionary Battle of Gettysburg took place in 1863. It is made from the finest walnut and maple wood and provides the perfect rustic backdrop for the eye catching chessmen. Not one but two chess boxes are included to contain the oversized chess pieces and keep them in mint condition for many years to come. The Animal Kingdom Chess Set is just exactly what you would expect from the name- a chess set that features many different members of the vast African animal kingdom as its chess pieces. Cats, snakes, giraffes, monkeys, elephants, zebras, and other animals face off on the chessboard, but it’s all in good fun. We promise that none of these animals will be harmed during the course of your chess game! 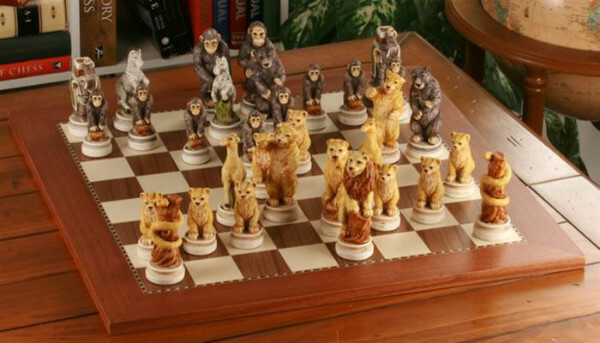 The Animal Kingdom Chess Set would be a great gift for the avid animal lover who plays chess. The chess pieces of this African animal theme chess set are made of oxo teak resin which feels like stone when cured, and hand painted with great detail by Italian artists. 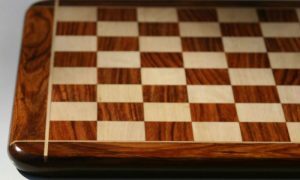 The chess board is made by Spanish artisans out of high quality sycamore and walnut woods with a beautiful inlaid border. These two carefully crafted elements come together to form a cute chess set that would be suitable for chess players of any age and gender. It seems like there is a nearly infinite number of themed chess sets available on the market today. You can find character chess sets that are themed around just about anything you can think of – superheroes, movies, TV shows, video games, fantasy settings, and even more obscure things like court rooms, anime chess set, and even college mascots! If you can dream it, chances are good that there’s at least one chess set themed around it available – and maybe even several! Because of this, there’s no reason that anyone should have to use an impersonal, traditional chess set if they would prefer something that’s more closely tailored to their own interests. Because of the extremely wide variety that’s available- a variety that is only growing larger day by day- theme chess sets make a great gift for anyone who plays chess. 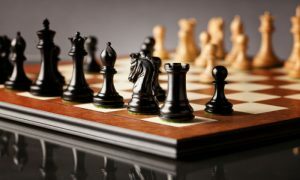 All you need to do to give a thoughtful and enjoyable gift to someone who plays chess is think of any one of their other interests and find a themed chess set based around that. If they’re interested in any of the themes we’ve covered on this list already, your work is done for you! If not, it may take a bit more digging, but you’ll eventually come up with a great present that combines at least two of your loved one’s interests into one delightful package. Make it three of their interests if you offer to spend time playing chess with them! 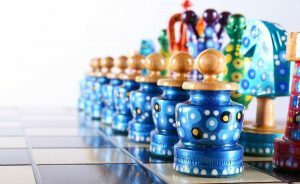 Theme chess sets are perfect as a personal purchase for your home or office, a gift for a loved one, or a collector’s item. When purchase for yourself, they allow you to express a bit more of your personality than a traditional chess set could. As a gift, they make your loved ones feel pampered, and as a collector’s item they only appreciate in value. Who wouldn’t want one?